A gaudy splash of yellow by the compost heap drew my notice one midsummer morning. I was recovering from a cranial aneurysm which had impaired vision in my left eye so I mystified by that flamboyant color. Upon investigation it proved to be a valiant cucurbita pepo. Thriving undisturbed with its brilliant chrome blossoms, springy tendrils, voluptuous young fruit, massive leaves—all attached to sturdy stems—it commanded me in no uncertain terms: You’ve GOTTA paint us! And dutifully I obeyed. 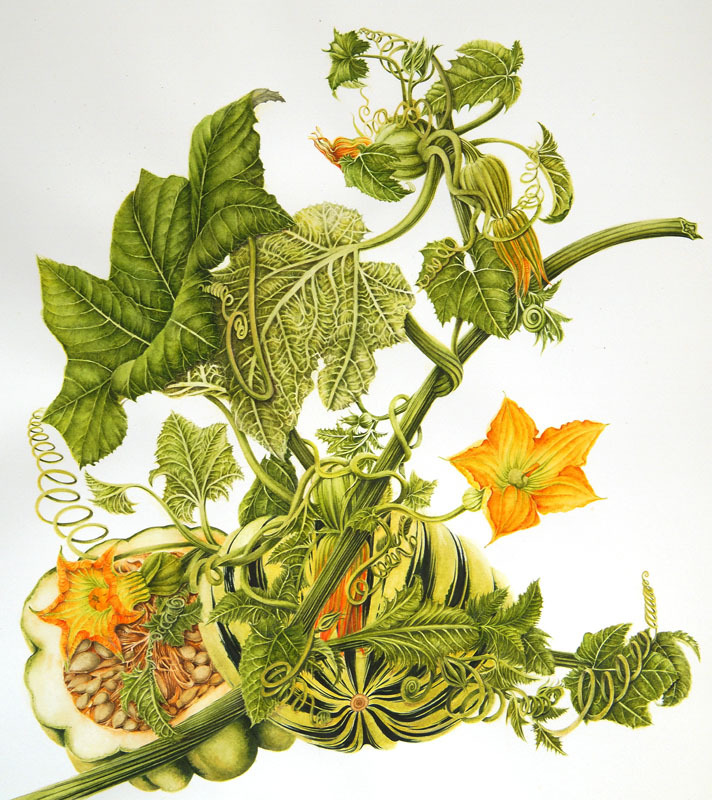 The Cucurbitaceae family includes numerous species of melons, cucumbers, gourds, gherkins, pumpkins and squash. The genus name cucurbit describes a vessel with a wide mouth which is a container for liquids and a constituent part of the alembic, an apparatus used by distillers. The species name is from pepon, Greek for large or ripe melon. My volunteer is a variety called “sweet dumpling”. With over a hundred genera and nearly a thousand species in the Cucurbitaceae family the genetic histories of the pumpkin, squash and gourd, are so intertwined that we often mistake one for another. Worldwide, in warm climes, cucurbits with edible fruits were among the earliest cultivated plants. We have evidence (from Mexico, Pharaonic tombs in Egypt and the Atharva Veda) that our ancestors grew and used cucurbits as early as 9,000 years ago for food and medicine. Depending on the variety, virtually all parts of the plant are edible—leaves, shoots, roots, flowers, seeds, young and mature fruits. Cucurbits come in a host of colors, shapes, size and weight, texture and flavor, ranging from tender, juicy and perishable to hearty and durable species that are stored for winter use. While the sweet, nutty tasting cucurbits are clearly preferred, certain bitter gourds, an acquired taste, are also savored. I distinctly remember my father being served a small helping at the start of lunch, to control his diabetes. As children we dared each other to try a tiny morsel without wincing at the intensely unpalatable taste! A folk remedy for malaria, flatulence, prostatic hyperplasia. healthy blood vessels, nerves and tissues, freckle removal, both an aphrodisiac as well as abortifacient—Cucurbitaceae seem a virtual panaceum. The hollowed dried fruit serve as water vessels, utensils, decorated storage containers, dippers and ladles, as ceremonial masks and as protective covering for male genitalia in some tribes. The resonant properties of pumpkins and gourds make them ideal musical instruments—stringed or wind or percussion. Rattles, drums, scrapers, marimbas, the tanpura, sitar and banjo—all owe their melodious existence to the hard exterior of a mere vegetable. Despite these virtues it is no compliment in any culture to be compared to a pumpkin, and a dreaded fate to be turned into one, as frequently happens in folktales! © 2011 – 2014, milly acharya. All rights reserved.